Reasonable offers considered, especially for a local NYC guitar sale. 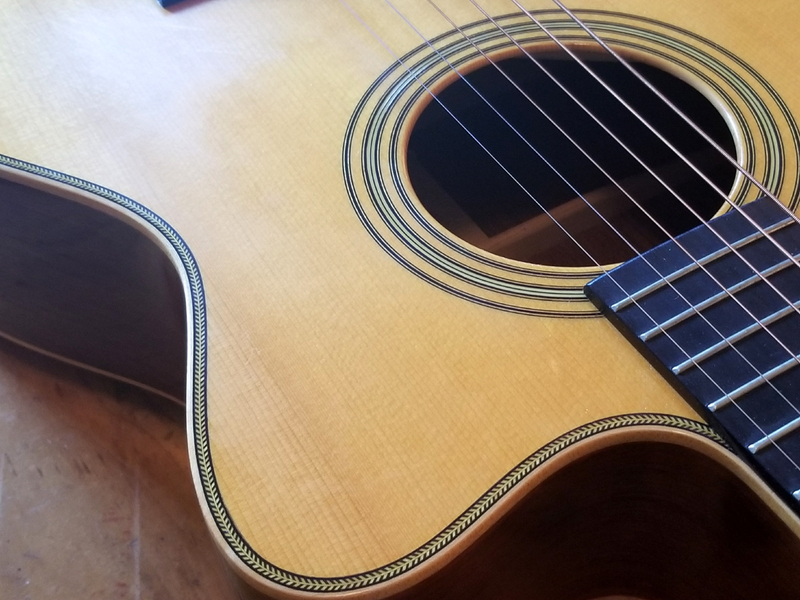 $4,000 – 2007 Martin Custom Shop 000C-28M – Madagascar rosewood, Adirondack spruce top and 1/4” Golden Era style Adirondack spruce bracing, Fishman Gold Line Plus undersaddle pickup. This has been my regular performance guitar for years, so it has basic playing wear. 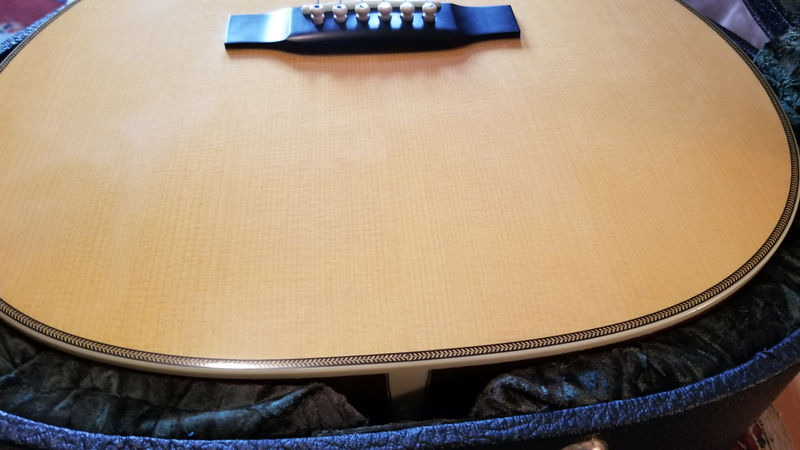 And it has a bit of buckle scratches from when I was playing a benefit concert and was asked to let a guest artist use it, who had an Ole Opry worthy belt buckle. I designed it to look like an OMC-28 Laurence Juber model, but it is a short-scale guitar and has flamed maple binding. Laurence played it and liked it well enough. But not enough to go short-scale himself. 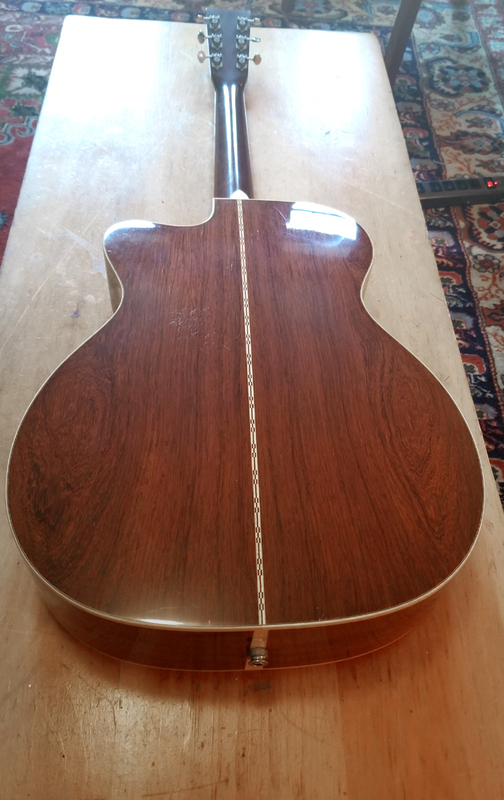 This has the same bracing and the same 1-3/4” Modified V neck with 1930s-style heel as the 000-18GE and the 000-42 Marquis, and the same 2-5/16” string spacing. But like a Juber model, it has a short drop-in saddle to accommodate the pickup. Also, this is the very first Martin guitar ordered from the Custom Shop with Madagascar rosewood back and sides. What I wanted was a short-scale Juber with 2-5/16” string spacing and flamed maple binding. By the time we were done horse trading, it had the GE bracing and GE neck shape, which I find more comfortable than the standard Modified V shape. Or I did. I have converted back to 1-11/16” Low Profile necks due to my aging high school football injuries. It is delightful, but detrimental to the continued disintegration of my wrist/thumb connection. 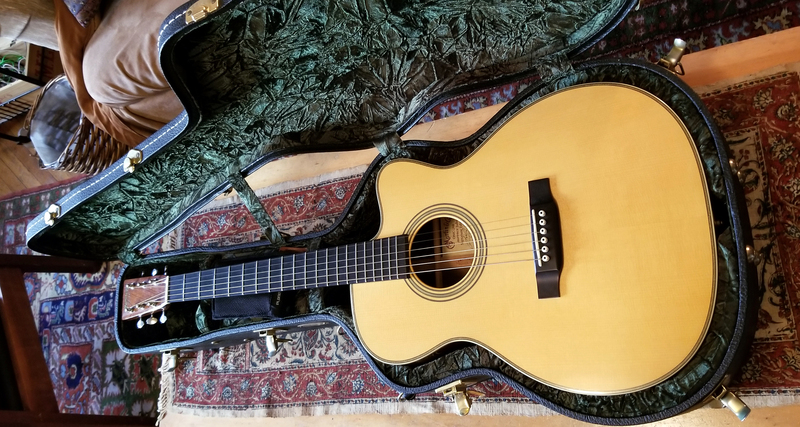 SOLD – $8,900 – 2004 Martin OMC-28B LJ Laurence Juber Signature model with Brazilian rosewood back and sides; Adirondack spruce top Grade 8LE (Limited Edition;) on-board duel-source B-Band pickup system, which blends an undersaddle pick-up with a bridge plate sensor. This is one of the finest-sounding modern Martins I ever played. I used it on more than half of my recent album Lost and Haunted Ways, because it just records SO WELL! I had always regretted selling my first one, when I was offered the first Schoenberg Soloist made with pearl trim, and I could not afford to keep both. 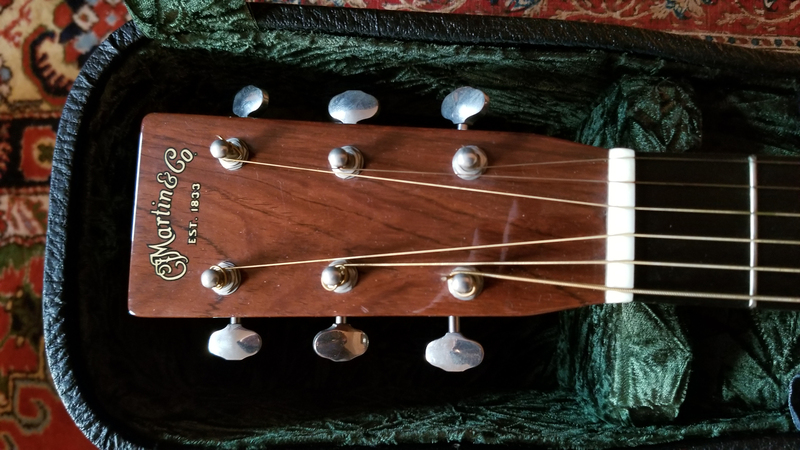 And when I had some cash I went looking for another Juber, and bought this one from a small-town preacher in California, with the pickup and strap button already installed. So, it was basically “used in church” before it came to me. But my dilapidated fretting hand just cannot take V necks any longer. I had my custom 000C-21 TSP made to replace it and the time has come for that to happen. 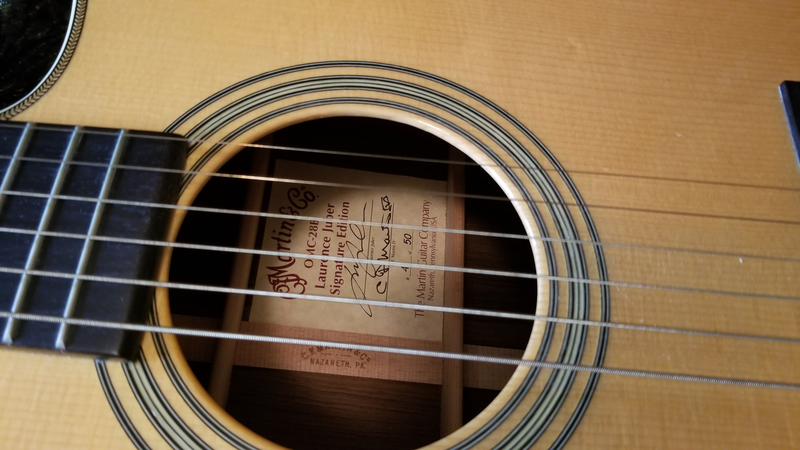 I ended up selling that Schoenberg to Chris Martin, which financed my Madagascar rosewood custom, above, which is also being sold for the same reasons – 1-3/4” V necks are bad for my health. I just played it again today, and it makes me sad as it sounds so freaking good.